Allama Raghib Ahsan, an adviser and confidant to Muhammad Ali Jinnah, was also a member of the Indian Constituent Assembly. New Delhi: Imran Khan, Pakistan’s recently sworn-in Prime Minister, has positioned himself as the rightful successor of the country’s founding fathers Muhammad Ali Jinnah and Allama Iqbal. Over seven decades since Independence, Jinnah and Iqbal are fixtures in discussions on Muslim identity in south Asia, but little is known about a confidant of the two who stayed back in India after Partition. Allama Raghib Ahsan, a significant part of the Muslim League and adviser to Jinnah on political affairs, was also a member of the Indian Constituent Assembly. In that, he had the rare distinction of guiding constitutions on both sides of the border. Born in 1905 at a village named Neodhi in Bihar, Ahsan was the son of Munshi Riazuddin, a government employee who worked in the postal department. He took part in the Khilafat Movement that started around 1918, going on to become a member of the Calcutta Khilafat Committee and helping mobilise public opinion against the Raj. As the proponents of Khilafat joined hands with Mahatma Gandhi’s non-cooperation movement for independence from the Raj, he was arrested in 1922. He also launched the All India Muslim Youth League. Still in his 20s at the time, Ahsan’s worldview was deeply inspired by the leading figures of the era. As the decade ended, he met Iqbal in 1929 and the two went on to develop a strong rapport. Writing emerged as Ahsan’s chosen tool as he sought to mobilise support for a Muslim nation. He served as editor of a weekly, Star, in Allahabad, as well as Star of India, a weekly published in erstwhile Calcutta. Stints in magazines Comrade and Hamdard followed. While his larger works include Jihad for Millathood, Kitab-i-Mubeen, and Light from the East, he is believed to have written hundreds of articles during his stint with the weeklies. He met Jinnah in May 1936. Soon enough, he became a core member of the All India Muslim League, of which Jinnah was a founder, and advised him regularly on local, regional and national political affairs. He joined the Calcutta Muslim League in 1936 and contributed significantly to the body’s growth in east India, particularly Bengal. The next year, he was inducted into the All India Muslim League council and the Muslim League parliamentary board. He remained a part of the council till 1948. His letters to Jinnah can be found in the Quaid-i-Azam Papers (File no. 204), which seek to highlight Jinnah’s role in the freedom struggle. In Bengal, he was a staunch campaigner for separate Hindu and Muslim electorates, and a critic of the Congress. 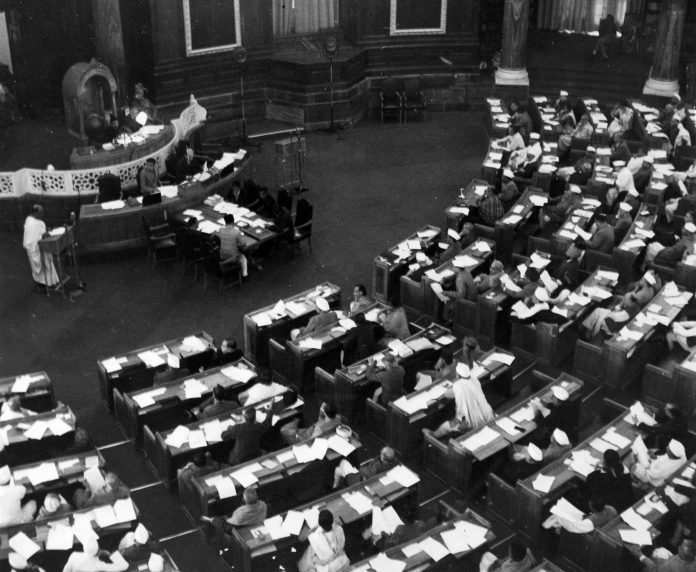 When the Congress ministries resigned in 1939 from the provinces over India’s forced participation in the Second World War, the Muslim League celebrated it as the ‘day of deliverance’. This was the brainchild of Ahsan, who told Jinnah it was a necessary political step to gain popularity among Muslims. In order to curb the Congress’ influence among Muslims, as also the popularity of its leader Maulana Abul Kalam Azad, he organised the Jamiat-i-Ulema-i-Islam on 11 July 1945 in Bengal to mobilise public opinion in support of a separate Muslim state. He was elected to the Constituent Assembly from Calcutta in 1946. After the Partition of India, Ahsan stayed in Calcutta and remained an ardent campaigner for Muslim identity. He wrote books such as the Pakistan Commonwealth, The Principles of Islamic Economics, and History of the Making of the Muslim Nation in India. He subsequently fled to Dhaka in erstwhile East Pakistan to evade arrest by the Indian government for his political prescriptions. He played a crucial role in the establishment of the framework of Pakistan’s constitution, with his idea of a welfare state incorporated into the objectives resolution on 12 March 1949. He joined Nurul Amin, the last Bengali leader of Pakistan, in opposing the creation of Bangladesh in 1970, and went to Karachi three years after the state was formed. He passed away in Karachi on 28 November, 1975.